To be perfectly honest, I had never been great at history when I was in school. I can never get the dates and events right, and it was hard to make the connections. I did have couple of really good history teachers to help bridge that gap for me. I was in eighth grade in 1989-1990. I remembered my grammar school teacher telling us about the Japanese Internment Camps in a narrative. At the end, he told us that he wanted to tell us what they didn’t state in our history books at the time. I don’t recall ever reading about it for class, specifically. I ended up forgetting about this for a time. I was reminded of this again when I went to Japan several years ago. Our stop was in Hiroshima, and we were reflecting on the remains of the city, the Peace Museum, and the Memorial that stood there. One of the people in our group said that her Grandmother is Japanese-American and did live in one of those internment camps. She didn’t speak about it much and wasn’t very willing to talk about it. They wanted to try to get her to talk more about it and learn more about her history before she is gone. 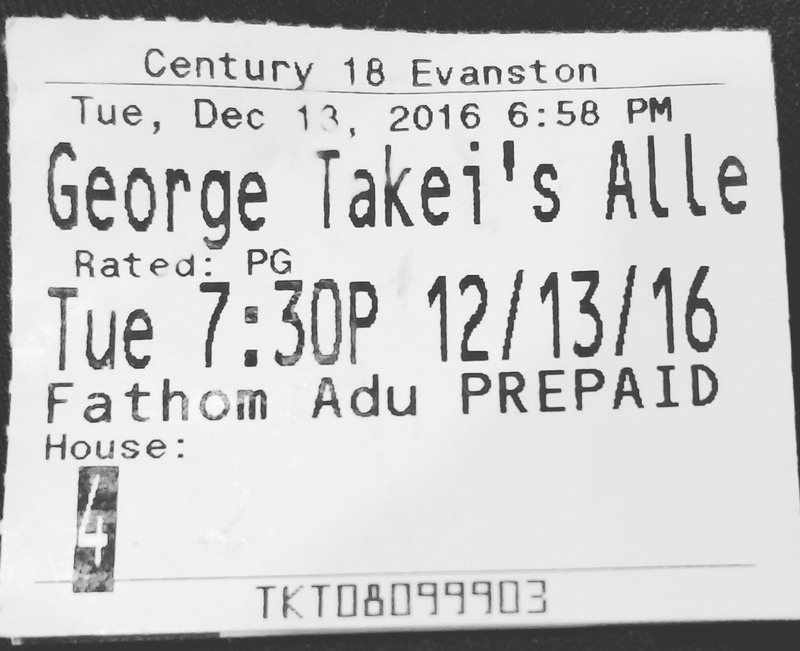 When I had learned that George Takei had also lived in a Japanese Internment Camp and they were making a musical based on his experience there, I was both curious and excited about it. Whether I didn’t remember this from school because it wasn’t mentioned versus me just forgetting about it, I’m not sure. At least this play would bring more awareness about what had happened so that we can learn from it. Besides, I’m sure that I am not the only one who either didn’t remember this part of history class or it was something never taught at all. Allegiance was broadcast in the theatres on December 13, 2016. It started off okay, but then we had technical difficulties 15-20 minutes into it where there was no sound. One of the patrons in the theatre even went as far as calling the theatre to alert them about the problem. Eventually they stopped and restarted the movie from the beginning and it went without a hitch. Now I could tell you how the acting was and about the storyline, but I feel that, by now, everyone has heard or read about it. That it was about Sam Kimura (Telly Leung) coming home from college to his family in California, soon to be relocated to an internment camp in Wyoming after Pearl Harbor gets bombed. Despite this, Sam still wants to show his patriotism and enlist in the US Army, despite the opinions of his Father and of others in the camp. Lea Salonga plays his sister, Kei, and George Takai plays both their Grandfather (Ojii-chan), and Sam Kimura when he is older. Christopheren Nomura plays the patriarch of the Kimura family, Tatsuo Kimura. The moment I heard his baritone voice in song, I am wondering why I haven’t seen him perform sooner. If anything, this was a chance to bring some talent to the forefront. We are familiar with Lea Salonga from Miss Saigon, Princess Jasmine and Mulan, and I think because of that, she sings at least one song in every scene. One of the positives from this movie is that it makes us aware of other Asian talent out there. Not to say that Lea Salonga was less than stellar – of course her singing was good. Telly Leung, though not a newcomer to the Broadway scene, still could act like this isn’t his first time on stage. He is fine once he is singing, though. The musical, though with a number of songs, still left me wanting more. I can’t put my finger on it, but I kind of wanted the songs to be a little stronger, or have a bit more punch. At least there is the set design. There were some really interesting sets that helped to accentuate the story or set the scene. One might be concerned about the scenes not translating well onto the screen, but in this case, they did. At the end of the day, though, there is one question: “Would I go back and see it again?” The answer to that is an enthusiastic “Yes!” Even with its shortcomings, it still was a good movie, and I was still entertained (which is the point of a performance, right?) Would I recommend this play/movie to others? That is also a “Yes” (see previous statement). Luckily, they have another showing planned. Since the original screening did so well, they will schedule another screening on February 19, 2017 with tickets on sale January 23rd. February 19th is the 75th anniversary of Executive Order 9066, which is known as the Day of Remembrance. So if you have the opportunity see Allegiance in the theaters, take that chance. You will have fun, be entertained, and learn a little something in the process. I am so sad I missed this in theaters. it sounds incredible.